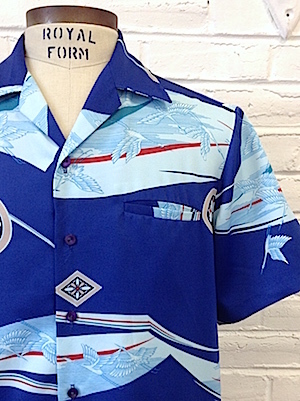 Home > Men's Vintage Shirts > Hawaiian Shirts > (M) Mens Vintage 70s Hawaiian Shirt! Blue w/ Cranes & Fancy Flower-esque Patterns! Mens vintage 1970s Hawaiian shirt! 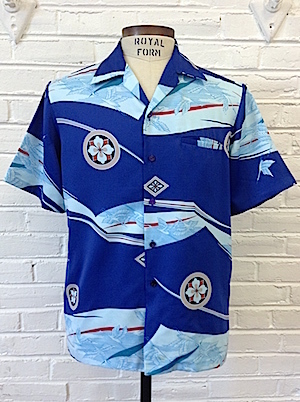 This gorgeous Hawaiian shirt comes in a rich shade of blue with a wavy light blue stripe with cranes flying in it that runs across the shirt. Throughout the shirt there are also decorative tan circles and diamonds with light blue and burnt orange flower shapes in the center! Closes in the front with pearly dark purple buttons with one pocket on the chest. Straight hem with a nice, wide 70s collar. Tagged by Mark Raysten. 100% polyester. Condition: Very Good.Has some pilling on the left sleeve and some light yellowish staining at the bottom of the shirt! Does not detract from the awesomeness of this shirt!